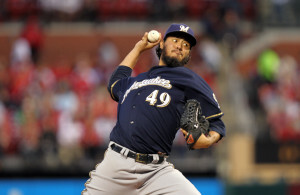 After making it through just four innings in his previous outing, Yovani Gallardo bounced back last night, holding the Chicago Cubs to a run on six hits in seven innings as the Milwaukee Brewers grabbed game one of the four-game series 3-1 at Wrigley Field. Mark Reynolds go the Brewers going with a solo home in the second, his team-leading 20th of the season. Khris Davis drove in the go-ahead run with a two-out double in the seventh and Scooter Gennett singled in an insurance run with two outs in the ninth as the Brewers took a 2 1/2 game lead on the Pirates and 3 games on the St. Louis Cardinals atop the Central Division. Gallardo improved to 7-6 on the season and 9-3 lifetime against the Cubs. Jake Arrieta (6-4) worked 7 1/3 innings, holding the Brewers to a pair of runs on five hits. Will Smith worked a 1-2-3 eighth inning for the Brewers and Francisco Rodriguez worked a scoreless ninth for his 36th save. Wily Peralta (14-6, 3.42) pitches game two for the Brewers tonight. Kyle Hendricks (3-1, 2.10) goes for the Cubs (7:05pm). Base running miscues cost the Milwaukee Brewers on Sunday in their 5-1 loss to the Los Angeles Dodgers at Miller Park. It prevented the Brewers from sweeping the Dodgers in the three-game series. Clayton Kershaw (14-2) picked up his 11th straight win, allowing a run on six hits in eight innings of work. The loss went to rookie Jimmy Nelson, who pitched six innings and allowed two runs on eight hits. Nelson (2-3) is expected to square off again against Kershaw on Friday in Los Angeles. Nelson doubled off of Kershaw in the third inning, extending his hitting streak to three games. But he was thrown out trying to advance to third on Carlos Gomez’s grounder to short. Gomez then was picked off first base by Kershaw. The Brewers had a runner at second base three times with nobody out and failed to score. But the Brewers did take 2 of 3 from both the Giants and the Dodgers on the home stand. They’ll open a 4-game series in Chicago against the Cubs tonight. Yovani Gallardo (6-6, 3.54) pitches for the Brewers. Jake Arrieta (6-3, 2.80) goes for the Cubs. Gallardo is 8-3 lifetime in 17 starts against the Cubs, but is making his first start against them this year. Milwaukee Brewers pitcher Yovani Gallardo (6-6) saw his streak of 16 2/3 innings without giving up a run snapped when the San Francisco Giants hit him for three runs in the first inning, pulling out a 7-4 win at Miller Park on Wednesday night. Gallardo gave up four runs on nine hits and walked four in four innings overall. It’s the second shortest outing of the season for Gallardo, who made it through just 3 1/3 innings back on May 20th in Atlanta. Gallardo had gone 6-3 with a 2.81 ERA in nine starts against the Giants before last night’s game. Michael Morse and Pablo Sandoval each drove in three runs to lead the Giants. Ryan Vogelsong (7-8) gave up one run on seven hits in six innings for the Giants to win back to back starts for the first time since May. Carlos Gomez led off the bottom of the first with a home run for the Brewers. Aramis Ramirez added a two-run single in the seventh and Khris David hit a solo homer in the ninth, but the Brewers fell to 3-6 in their last nine games. Wily Peralta (13-6, 3.52) pitches the series finale this afternoon for the Brewers, facing San Francisco’s Jake Peavy (0-2, 4.85). First pitch is 1:10pm this afternoon at Miller Park. The Milwaukee Brewers blanked the Tampa Bay Rays 5-0 yesterday, avoiding a 3-game sweep at Tropicana Field. Yovani Gallardo (6-5) held the Rays to four hits over seven shutout innings to post his sixth win of the season. Martin Maldonado had a big day for the Brewers. 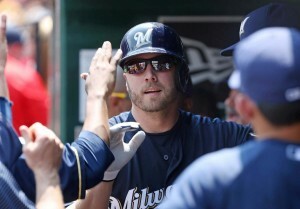 He had three hits and tied a career high with four runs batted in to lead the Brewers offensively. Tampa Bay’s David Price took the loss, ending his 7-game winning streak. Barring a Thursday deal, it looks like the Rays have decided to hang onto their ace with the trade deadline approaching at 3pm this afternoon. The Brewers enter today’s off day with a 2-game lead on the Pittsburgh Pirates and 2.5 over the St. Louis Cardinals in the NL’s Central Division race. The Brewers will open a 3-game weekend series in St. Louis against the Cardinals starting Friday night. Matt Garza rebounded from a poor start last weekend to pitch the Milwaukee Brewers to a 9-1 win over the New York Mets last night at Miller Park. Garza allowed a run on two hits in eight innings of work to improve to 7-7 on the season. He gave up five runs in one-third of an inning last Saturday in Washington. The only run surrendered by Garza came on a seventh-inning homer by Lucas Duda. Jonathan Lucroy, Khris Davis and Ryan Braun all homered for the Brewers, who won their fourth consecutive game. The Brewers win gives them the best record (58-45) in the National League and a 3-game lead in the National League Central Division over both St. Louis and Pittsburgh. Yovani Gallardo (5-5, 3.79) pitches tonight’s game at Miller Park. The Mets go with Zach Wheeler (5-8, 3.78). The Milwaukee Brewers missed out on a season sweep of the Colorado Rockies, falling 10-4 at Miller Park yesterday. As good as the Brewers have been most of the season, they were equally as bad yesterday. They gave up three runs on one two-error play in the 5th inning. Losing pitcher Yovani Gallardo retired the first two hitters of the game, then walked Justin Morneau and gave up four straight solid hits. Gallardo worked 5-innings, allowed 10 hits and 8 runs (5 earned), falling to 5-5 on the season. The Brewers completed a stretch of 20-games in 20 days, going 13-7 during that stretch. They finally get a day off today and will open a series in Toronto on Tuesday night against the Blue Jays. For the second straight night, the Milwaukee Brewers struggled with the bats and fell to the Washington Nationals 4-2 in 16-innings. 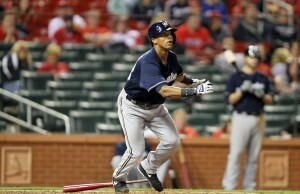 The Brewers fell 3-0 on Monday night and have accumulated 13 hits in 25 innings in the first two games of the series. Ryan Zimmerman clubbed a 2-run home run in the top of the 16th and then made a diving catch in the bottom half to pull out the win. In both the 13th and 15th innings, the Nationals walked Jonathan Lucroy to get to Carlos Gomez. In the 13th, with the winning run at 3rd, Gomez lined out on the first pitch to the shortstop. In the 15th, Gomez swung again at the first pitch and popped up with the winning run at second base. Both bullpens were solid. Mike Fiers ended up taking the loss for the Brewers. He allowed Zimmerman’s home run in the 16th. Yovani Gallardo lost for the fourth time in his last five games as the Milwaukee Brewers fell to the Minnesota Twins 6-4 at Miller Park last night. Five of the Twins six runs came on a pair of home runs. Josh Willingham clubbed a three run home run in the 3rd inning and Brian Dozier clubbed a two run home run in the 5th. The loss dropped Gallardo to 3-4 on the season with a 4.08 ERA. In his last six starts, Gallardo is 1-4 with a 6.55 ERA. Offensively, the Brewers had a number of opportunities but hit into three double plays in five innings against Twins starter Samuel Deduno. The Brewers split their two-game series with the Twins at Miller Park. The two teams will now play a two-game series in the Twin Cities. It’s the start of a busy road schedule for the Brewers, who will play 15 of their next 18 games on the road. Marco Estrada (5-2, 4.03) pitches for the Brewers. Minnesota goes with Ricky Nolasco (3-5, 5.70). from the Orioles at Miller Park on Wednesday. Ryan Braun, Carlos Gomez and Khris Davis combined to go 6 for 9 with 6 rbis and 5 runs scored. Davis clubbed a three run homer in the 8th inning, going 2 for 3 on the night. Davis went 7 for 11 in the series with three home rums and five rbis. 3-3. Gallardo retired the first two hitters he faced in the 4th, then walked the bases full. He pitched out of it. Gallardo did serve up two home runs, but both were solo shots to Nelson Cruz. In his final inning of work (7th inning), Gallardo again retired the first two batters he faced. Nick Markakis then doubled to right and in came Brandon Kintzler. Kintzler served up Manny Machado’s single to center that scored Markakis and Adam Jones followed with another hit and Kintzler was done. Will Smith came on to get out of the jam in the 7th and worked the 8th. The Brewers then gave the bullpen some cushion to work with by scoring four runs in the bottom of the 8th and cruised to victory. The Brewers are off today and will open a three game series against the Chicago Cubs on Friday night.